This offer is only applicable to Amazon orders. A senior official stated hacking cars was now ‘child’s play’, taking just 30 seconds to unlock your car and drive away. With car thefts doubling in two years, a former transport minister called it an epidemic. Typically a relay is used to pick up the signal from a car’s keyless fob and transfer it to an accomplice standing next to your car. This tricks your car into thinking you are standing next to it with the keyless fob, even if you are nowhere near, or the key is sat in your house with the car on your driveway. All signals in the range of 10kHz to 30GHz are blocked thanks to the special lining. 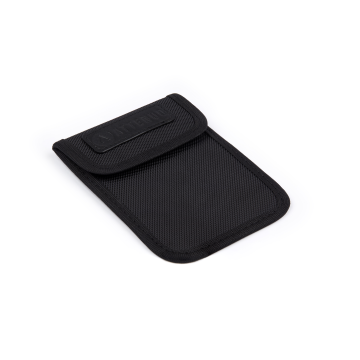 Incoming electromagnetic fields are distributed throughout the mesh lining and canceled out, meaning any electronic devices placed within the pouch will be completely cut off to the outside world. 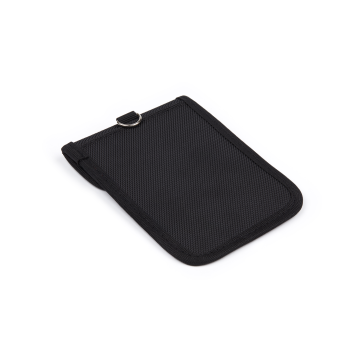 The compact 125x85mm size slips easily into your pocket or purse/handbag. The outer layer is a black, durable oxford cloth weave. The inner layer consists of a copper & nickel blended weave which creates the faraday cage. 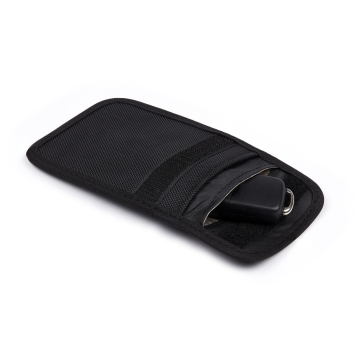 Together they form a durable exterior with a super secure interior for your car keys, with plenty of flexibility to sit in your pocket unnoticed.